To summarize current knowledge pertaining to two photodermatoses, actinic prurigo (AP) and hydroa vacciniforme (HV), both of which routinely have onset in childhood. 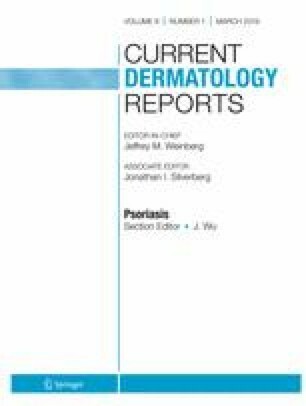 AP is an immune-mediated photodermatosis associated with human leukocyte antigen DR4 that commonly features cheilitis and conjunctivitis. It mostly affects American Indian/Latin American Mestizos and rarely white and Asian patients, who manifest different disease phenotypes. The diagnosis is clinical, but follicular cheilitis is a characteristic mucosal biopsy finding, and phototesting may be helpful. Hallmarks of treatment are photoprotection and thalidomide. HV is a photodermatosis related to Epstein-Barr virus infection that causes varioliform scarring. Classic HV is benign and self-limited and must be distinguished from hydroa vacciniforme-like lymphoproliferative disorder (HVLLPD), a systemic disease most common in Asia and Latin America with risk of progression to lymphoma. Limited treatments are available, but accumulating data suggest chemotherapy is associated with worse outcomes in HVLLPD. As understanding of these photodermatoses progresses, important knowledge gaps persist. AP’s pathogenesis remains incompletely elucidated, and therapeutic investigation has stagnated. Despite enhanced description of HV and HVLLPD, both lack standardized effective therapy. Brandon L. Adler and Vincent A. DeLeo declare no conflict of interest. United States Food and Drug Administration. THALOMID ® (thalidomide) NDA # 020785. https://www.fda.gov/downloads/Drugs/DrugSafety/PostmarketDrugSafetyInformationforPatientsandProviders/UCM222649.pdf. Accessed December 29 2018. U.S. National Library of Medicine. ClinicalTrials.gov. https://clinicaltrials.gov/. Accessed March 10 2019. •• Liu Y, Ma C, Wang G, Wang L. Hydroa vacciniforme-like lymphoproliferative disorder: clinicopathologic study of 41 cases. J Am Acad Dermatol. 2019. https://doi.org/10.1016/j.jaad.2019.01.011 Largest series of HVLLPD published to date. Provides further evidence of better prognosis in Asian versus Latin American patients and suggests poor outcomes in chemotherapy-treated patients.